There is a quite popular method of preserving basil in olive oil, so that it lasts for up to one year, all over Pinterest. I was skeptical. Because infused olive oils at home can harbor botulism. But this method includes the addition of salt — so maybe, perhaps, the salt kills the Botulism? I wasn’t sure. 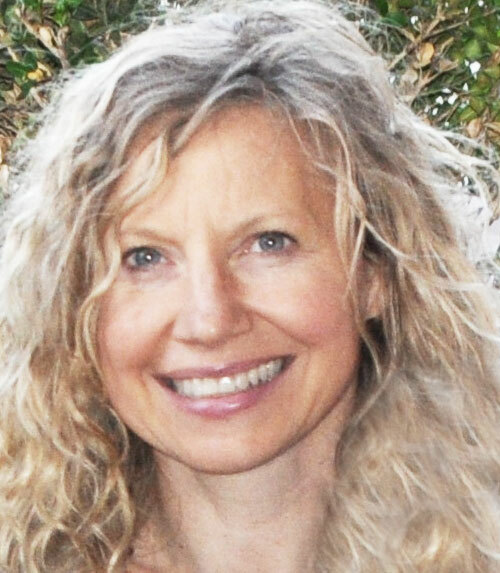 So, to be safe, I checked with the county extension office of Oregon State University, The Ohio State University, and the Wild Fermentation group on Facebook, with its 42,000 members. First, why is this so important of an issue? Botulism can lead to DEATH!!! Botulism is odorless and tasteless! You wouldn’t even know you were serving it! And even if you don’t die, the side effects can be serious and last for several years. Cooking involves grave responsibility. You may think you’re being frugal and clever with this method, but this is not worth the risk! The consensus? Refrigerating herbs in olive oil IS NOT a safe way to preserve basil. This will lead to botulism. 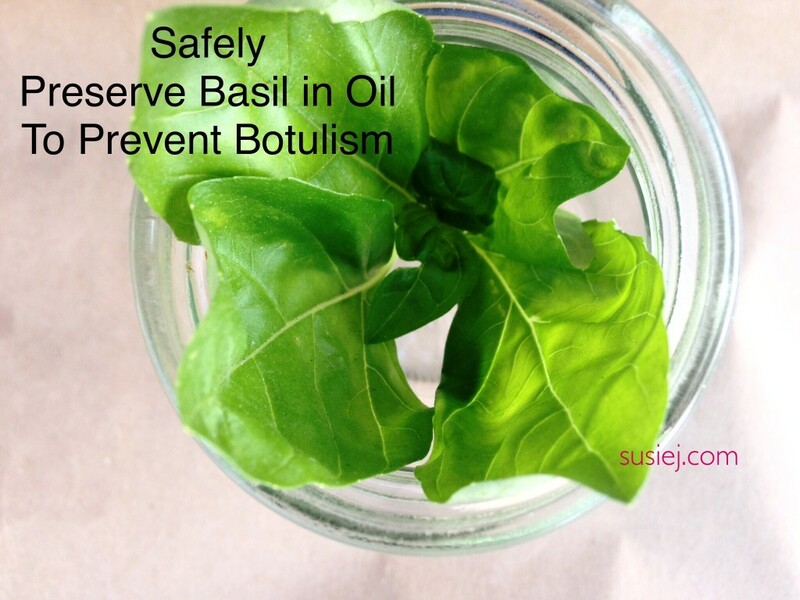 The salt does not inhibit the growth of botolium, but in fact, can draw out the water from the basil leaves and lead to the growth of Botulism. Herbs and oils are both low-acid and together could support the growth of the disease-causing Clostridium botulinum bacteria. Oils may be flavored with herbs if they are made up for fresh use, stored in the refrigerator and used within 2 to 3 days. There are no canning recommendations. Fresh herbs must be washed well and dried completely before storing in the oil. The very best sanitation and personal hygiene practices must be used. Pesto is an uncooked seasoning mixture of herbs, usually including fresh basil, and some oil. It may be frozen for long term storage; there are no home canning recommendations. — Marilyn, Ohio State University Extension Office. 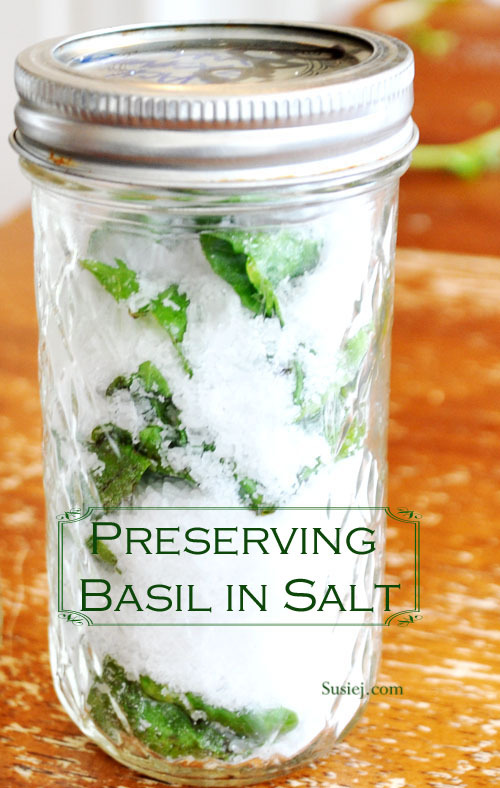 But, the experts recommended, you can preserve basil in olive oil and salt, IF you freeze it and keep it frozen. The cold temperatures will inhibit the growth of botulism. Olive oil does soften quickly, so perhaps sticking your jar in the freezer, and pulling it out just to “soften” the oil for ten minutes is enough for you to scoop some out. Then, put the jar back into the freezer. Or, of course, you can freeze small batches in ice cube trays, and freezing the cubes to pull out as needed. Wash fresh basil leaves, removing traces of dirt. Dry the leaves. You want them as dry as possible. Fill jar with Basil leaves, salt and continue your layering. Once the jar is full, pour olive oil over the top. You can start with a large jar, and harvest a bit of Basil at a time, as your plants begin to fill out. Just continue to add more basil leaves as your harvest fills out. 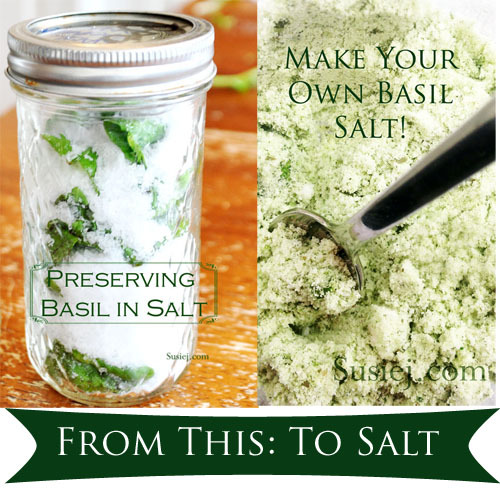 Or — you can always skip this, and preserve your basil in salt and pull out the leaves as you go, without all the fuss. Either way, just be safe. I tried the basil – olive oil – salt layering technique. Sealed in air tight container. Stored in fridge. Wanted to use some basil about 2 weeks later – layer of fuzzy mold on top. Thanks so much for posting this info, I was worried about this and finally found an answer that ai can rely on! Is it possible to pressure can with oil to preserve on the shelf? I know itll cook it but ya still have the basil/olive oil paste to add to soups sauces or whatever else. I don’t know! Maybe the county extension office would know — they’re always doing all kinds of experiments! I freeze chopped basil, oregano,garlic and thyme in ice cube trays covered in olive oil. After about 3 weeks I QUICKLY remove cubes and wrap 4 or 5 cubes in waxed paper put them into freezer bags. I remove as many I need for whatever dish I am cooking. I have been doing this for about 5 yrs now with no issues. I have everything I need for a number of the dishes I prepare. You can also do just basil and olive oil if you want. I wouldn’t recommend it for salads just for cooking. Great solution … that way, it’s safe, in the freezer, and you only have to get out exactly what you need.